Anxiety continues to be one of the top reasons for parents to bring their children into therapy. Our world is continually filled with unknowns and ever-growing pressures that is no wonder why are kids are filled with doubt and uncertainty as well. Talking about anxiety and worry is a great way for children to understand what they are feeling as well as ways to cope with anxiety appropriately. Reading books on the subject can be a great way to open up a discussion on the topic. A Bad Case of the Stripes, by David Shannon … this is also an excellent book about the importance of being yourself. Because sometimes if you try to hid who you truly are the end result is a lot of anxiety … or a really bad case of stripes. The book is particularly helpful for kids struggling with certain types of school anxiety. Wilma Jean the Worry Machine, by Julia Cook … Wilma Jean has a horrible case of the “What ifs”. Her mom and teacher help her find solutions. When Lizzy was Afraid of Trying New Things, by Inger Maier … sometimes anxiety is centered around fear of the unknown or trying new things. This tells the story of Lizzy the sheep and how she overcame her fear. When Fuzzy was Afraid of Losing his Mother, by Inger Maier … Fuzzy (Lizzy’s brother from the above mentioned book) has separation anxiety. The Kissing Hand, by Audrey Penn … I think of this book as the CLASSIC book about separation anxiety. It reminds us all that a parent’s love is always there. I use the Kissing Hand technique with both of my own kids all the time. The Invisible String, by Patrice Karst … This is another great book for kids with separation anxiety, but also for anyone who has lost someone special in their life. The story covers the fear of loneliness and separation and how love keeps us tied together. Henry’s Show and Tell, by Nancy Carlson … This is a great one for kids that have anxiety about talking at school or standing up in front of their class. Wemberly Worried, by Kevin Henkes … Wemberly Worries about EVERYTHING. A great book about how she handles starting school … (but can be great for any child who worries a lot). Wemberly’s Ice Cream Star, by Kevin Henkes … A cute story about coping with worry. Sheila Rae, the Brave, by Kevin Henkes … How to cope in those times when you’re not feeling so brave. The OK Book, by Amy Krouse Rosenthal … It’s ok, you don’t have to be great at everything! Chopsticks, by Amy Krouse Rosenthal … A good book for those having trouble trying life out on their own. You’ve Got Dragons, by Kathryn Cave .. This is my all-time favorite book about anxiety. It does SUCH a wonderful job of illustrating anxiety and discussing what works (and what doesn’t) in helping relieve it. Typically after I read this story in session I have my client (child, teen, or adult) draw a picture of their dragon. It can serve to be a wonderful starting point and continuing discussion about their unique anxiety issues. Do have any books to add to the list? I’d love to hear from you! Please leave a comment. Thank you so much for this! 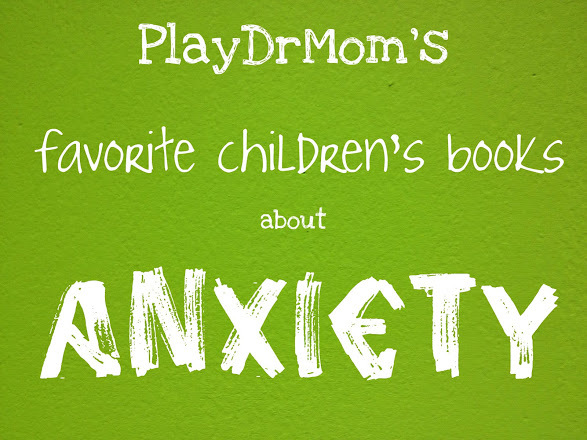 As a mom of a child with anxiety, I know these books will be a big help. Just pinned this! Ohhh thank you SO much for this list! I have a little one who is fearful of everything but mostly of losing me:) On my way to the library to get a peek at these! I’m so glad you all have found it helpful! Thanks for your comments!!! A great list! Thanks for posting these! We enjoy many of these as we already have a few in our home library! It’s hard for little ones growing up, so many new and often scary things, it’s nice to know that a book can help them understand how to deal with these everyday things. Another one we picked up recently that we’ve been reading together as part of family time is “A Mango in the Hand” by Antonio Sacre. It’s told in proverbs so it’s been great for starting conversations with the girls about what they’ve learned. You can find it at http://www.antoniosacre.com, if anyone else checks it out I’d love to hear what kinds of responses you get from your kids. It’s about a young boy who is growing up and needs a little help along the way. Thanks again for this list, it is great! Great list! My kids really gravitate toward the Little Critter series, which does not shy away from things that are difficult or scary — the dentist, bad friends, and being mad, for example. GREAT suggestion, Carol! My kids LOVE those books too … can’t believe I didn’t include them in the list! Thanks for the comment! Great list! Thanks for linking up to tip-toe thru tuesday. I have another one to add to the list – The Adventures of Lulu by Louise L. Hay. It had three cute stories that teach kids how to make positive affirmations to build self-esteem and help with fears and anxiety. It especially helped my kids stop fearing the dark. Every night, they repeat “There is nothing here for me to fear. I’m safe and well protected.” It really seems to work. This is a wonderful list. My son is currently experiencing some anxiety and a book that was recommended to us is “Silly Billy” by Anthony Browne. It’s about a young boy who worries about absolutely everything. His Grandma gives him some worry dolls and it helps him to sleep at night. I bought the book and a worry doll and my son loved them both and before going to sleep he said “I don’t have any worries now”. What a great resource!! Thank you so much for sharing at Sharing Saturday! Two Shy Pandas, Too Shy for Show & Tell… I like these books too. Thanks for your list. Thanks, Fiona! I’ll have to check out those books too! I love ‘Silly Billy’ too! PS Thanks for all of your other great recommendations! Going to borrow some of these from our library this week!